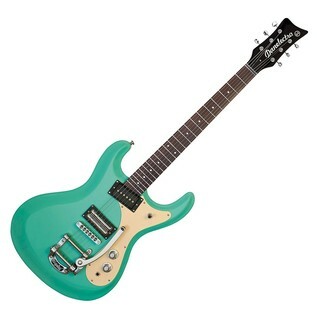 The Danelectro 64 Electric Guitar is a stellar tribute to the 1960’s classic. The vintage appearance features die cast replicas of original hat-style control knobs, as well as a vibrant Aqua finish. Its retro characteristics are further enhanced by the chrome-plated hardware and the contrasting cream-coloured peanut pickguard. When it comes to playing comfort however, the Danelectro 64 embraces the present day with a wider, flatter neck profile which allows an easier playing style. Other notable retro features include the Bigsby vibrato bridge for vintage style pitch bending, and a zero fret that gives the open strings a truer ring and improved intonation . The pickups feature a lipstick humbucker at the bridge and a single coil at the neck. The body is crafted from masonite which offers accentuated highs, and the neck is made from maple with a rosewood fingerboard. This vintage inspired guitar is ideal for any level of player, especially someone wanting an authentic 1960s powerful crunch.